To wash the manufactured trunk of hen in cold water and wholly to cook. To clean and wash down a potato, cut tubers in half and to cook in separate tableware. To put the prepared potato in a frying pan, on a potato put the hen cut to pieces, and from above to inundate a Tatar vegetable sauce. To close Skovoroda a lid, to put on a cooker or in a stove and to braise 30 min. Hen is served up in a frying pan and then laid out in piattis. Similarly a Tatar duck and turkey prepare. 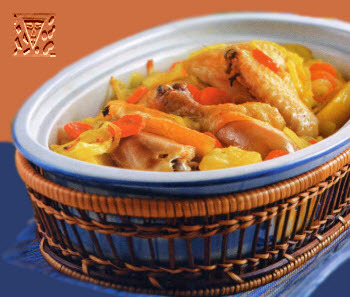 Ingredients: Boiled hen - 100 g, bow - 35 g, carrot - 35 g, boiled potato - 150 g, clear soup - 30 g, melted butter - 10 g, salt, pepper. To cut the cleared slices of carrot, bow - by rings, to put in deep stewing pan, inundate clear soup and to put on a fire. After boil to add salt to liking, pepper by a pea or pepper ground, to take to readiness. 5 minutes prior to a willingness to put a laurel sheet, oil. The prepared sauce is given to the boiled meat, bird with a potato and kullama. On 100 g of sauce : carrot - 35 g, bulb onion - 35 g, melted butter - 10 g, clear soup - 30 g, salt, pepper, laurel sheet. To cook meat-broth (better from mutton, beef or hen). Pass through a filter him, to pour off part for preparation of dough, to use remaining clear soup for cooking of soup. For preparation of trickled pastries to pour the sifted flour in tableware, in the middle to do deepening, add an egg to him, put salt and, little by little refilling clear soup, to knead dough. Clear soup for chumar must be not hot, an egg can coagulate otherwise. Dough must turn out liquid (as thick sour cream) enough, well mixed to homogeneous mass, that did not flow down from a spoon. From the prepared dough to take small pieces by a size with hazel-nut and to lay them in the boiling added some salt and pepper clear soup or soup. To cook chumar to readiness (12-15 minutes), after to lay out on piattis and serve up. Clear soup is given in separate tableware. Trickled pastries can be made out of wheat, peas, buckwheat and lentil flour. Flour - 35-40 g, eggs are 1,5 th., water or clear soup - a 30-40 g, salt, pepper to liking. Samosa prepare from unleavened dough, filling can be meat, fish, vegetable, baccate or egg. 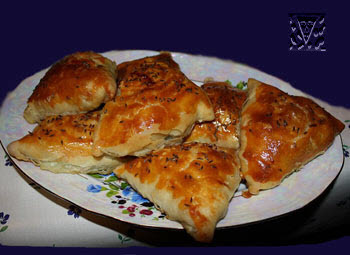 For samosa a beef or veal befits well, in the Uzbek kitchen more frequent use mutton. You will mince a onion and meat on a meat grinder. Then will salt and pepper the turning out stuffing. Dough will divide into pieces for 50 gs roll, will lay out filling on a middle and wrap up the edges of dough in form triangles. Smear a roasting pan sunflower-seed oil and will lay out samosa in the distance one from another. Smear the surface of samosa the fluffed up egg and bake in an oven warmed-up to 200 degrees during 25 minutes. On one samosa: a 50 g of dough, 35 g of the chopped meat, 6 g of oil, onion, pepper, salt, for greasing egg. Usually such samosa prepare adding rice. Cleared and washed rice steep in the salted water, scald and skip through a sieve. A bit cooling add the finely cut boiled egg and mix. Further we prepare triangles as well as for samosa with meat and bake. Shanga is a very ancient dish. It was widespread in regions, by the inhabited people of Finno-Ugric group from Karelia to Ob. 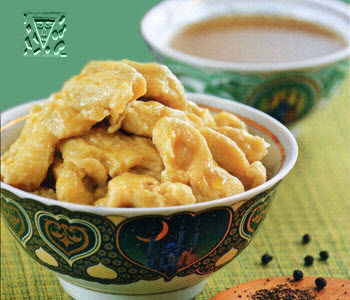 To date has widespread in the domestic kitchen of Ural and among Siberian Tatars. From yeast dough do marbles mass an about 70 g, lay on folias, smeared by oil, give to stand in a heat a few minutes, do deepening and lay filling on him, oil by egg and bake. For filling the boiled potato is pounded, adding hot milk with eggs and sour cream, mix well. Composition: dough - flour wheat 40, sugar 3, oil 3, egg 1/20 th, milk 10, salt, yeasts. filling - potato 60, milk 10, egg 1/10 th, sour cream 8, bow 10, oil 2. Yeast dough is divided to pieces by mass of a 60-70 g, roll them in round small cakes by a diameter a 7-8 sm, lay on folias, smeared by oil, give to stand in a heat a few minutes. 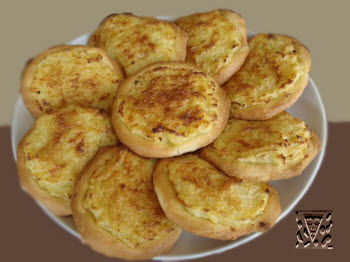 The sour cream filling is oil from above small cakes and bake to readiness in an oven. Composition: yeast dough - 1 kg, filling - flour 1/2 glasses, egg of 1 th, sour cream 1/2 glasses, vegetable oil 2/3 glasses, salt and pepper to liking. 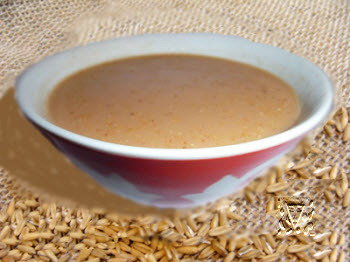 Talkan is considered an ordinary dish and prepares from a wheat, buckwheat, more frequent from oatmeal. For talkan at first prepare a flour: the cleared grains boil, evenly laying dry out and grind in a flour. In a cauldron (pan) melt butter, infuse into the added some salt water and take to boiling, add a flour and mix well. Flour must divide evenly, without lumps. Prepared talkan in piattis served up hot, adding butter (каймак or катык) from above. In the melted heated butter add a ready oatmeal and fry to turning red, after infuse into the added some salt water and quickly mix well. It is also possible to prepare talkan from other types of flour. On 1 kg of flour : a 200-300 g of water, 200 g of oil, salt to liking.